These words, taken from a report by the High-Level Panel on Humanitarian Financing (2016), demonstrate the pressing need to find more effective and more efficient ways to address the needs of crisis-affected populations. Some of this change may come through high-level policy initiatives, but it also requires that humanitarian actors continuously search for new ways to address problems in an ever-changing global environment. The humanitarian sector has always relied on the determination and ingenuity of those on the front line working to deliver life-saving aid to communities affected by conflict or natural disaster. But while reactive innovation has always been central to humanitarian action, the systematic application, study and implementation of proactive innovation is recent, linked to wider shifts in humanitarian actors’ application of innovation management theories from outside the system (Obrecht and Warner, 2016). The starting point for this shift was a growing recognition that “much ongoing work in the realm of humanitarian learning and accountability does not seek to generate new and different ways of operating. Rather, it focuses on existing practices, policies and norms of behaviour, and involves detecting and correcting deviations and variances from these standards, or finding ways in which standard operating procedures can be better implemented” (Ramalingam, Scriven and Foley, 2009). How is innovation different to standard programming? 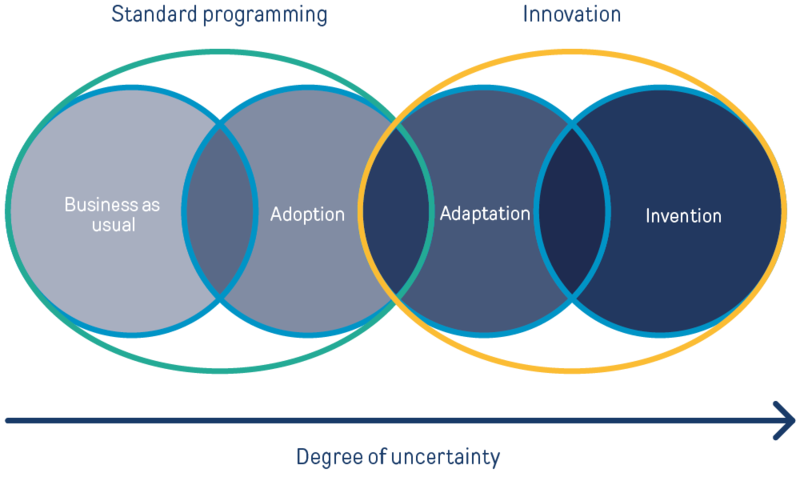 In contrast to standard programming, innovation is a process of creative problem-solving that seeks to generate new and improved ways of operating – questioning existing practices, norms, policies and rationales – and to contribute to lasting positive change in how assistance is delivered and how communities can become more resilient. It involves a large degree of uncertainty, and significant learning to overcome gaps in knowledge and evidence. How can innovation thinking be applied? A new product might require new processes to support it (eg, IFRC). A new process might lead to a new product (eg, HIF Challenge). A new product might enable a change in how it is positioned (eg, Action Against Hunger). A new product and process might inspire a fundamental rethink of how humanitarian aid is delivered (eg, Field Ready). It is important to note that technology does not equal innovation, although it has often driven innovation by providing the enabling conditions and the vehicle through which products, processes, positions and paradigm shifts can be imagined, produced and delivered. As the humanitarian innovation agenda has evolved, there is an increased un-coupling of technology and innovation, and recognition that this can only be part of the solution. What does successful innovation look like?